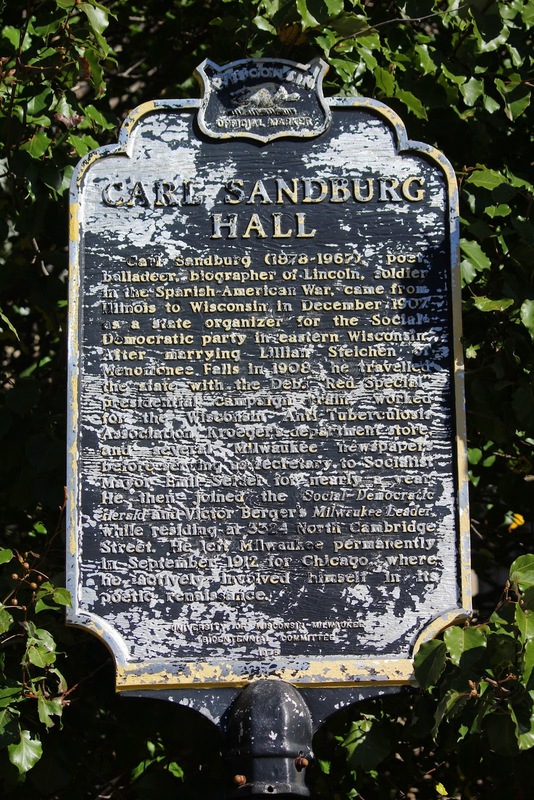 Carl Sandburg (1878-1967), poet, balladeer, biographer of Lincoln, soldier in the Spanish-American War, came from Illinois to Wisconsin in December 1907 as a state organizer for the Social-Democratic party in eastern Wisconsin. After marrying Lillian Steichen of Menomonee Falls in 1908, he travelled the state with the Debs “Red Special” presidential campaign train, worked for the Wisconsin Anti-Tuberculosis Association, Kroeger’s department store, and several Milwaukee newspapers before serving as secretary to Socialist Mayor Emil Seidel for nearly a year. He then joined the Social-Democratic Herald and Victor Berger’s Milwaukee Leader, while residing at 3324 North Cambridge Street. He left Milwaukee permanently in September 1912 for Chicago, where he actively involved himself in its poetic renaissance. The marker is located in front of Sandburg Residence Hall on the UW-Milwaukee Campus, on northbound North Maryland Avenue, just south of its intersection with East Newport Avenue, Milwaukee, Wisconsin 53211. Marker is to the far left in this photo.